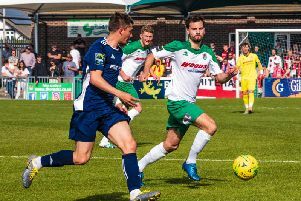 Ryan Peake’s late winner sealed a second-half comeback as Chichester snatched all three points away to Langney Wanderers to keep in touch with with the top of the SCFL Premier. City's first chance came when Josh Clack latched on to a back pass but couldn’t find a team-mate when his shot rebounded off Langney keeper Dan Hutchins. At the other end, Wayne Wilkinson tried an ambitious effort after he robbed a pass intended for left back Ellis Martin. Clack linked up with Scott Jones who fed Kaleem Haitham. Haitham jinked past a defender or two but his cut-back eluded on-rushing players in the box. Max Hollobone and Wilkinson nearly combined as the hosts pressed and Paul Rogers dragged an attempt wide. A mistake on 16 minutes got Evan Archibald in. The Langney player had a lot to do but he managed to beat Jordan Matthews. Martin was booked for a challenge on skipper Adam Davidson and David Smart beat Matthews with a set-piece the Chi keeper might have kept out on another day. City, 2-0 down, were in trouble and Matthews had to come a long way out of his area to intercept a through ball as the hosts threatened to add a third. Clack had a chance though to get the visitors back in things but missed from close range as he got on the end of Terrell Lewis’ cross. Hollobone spurned an opportunity to make it 3-0 as he reached Connor Cody’s header back to Matthews before the keeper only pull his shot wide. With half-time approaching George Way rolled a free-kick to Clack whose fierce drive was deflected for a corner and when this came in Hutchins gathered under pressure from Jones. Matt Fear, another recent signing from Eastbourne Town, was in the right place at the right time but his shot at the far post was turned out for a corner. Top scorer Jones hauled Chichester back into the game on 51 minutes with a well-directed header from an inviting delivery from Haitham. Two good chances came and went for the hosts in as many minutes. First Hollobone lifted a shot over the bar and then Archibald headed wide with the goal at his mercy. Langney paid the price just before the hour mark when Haitham equalised after a cross from Clack wasn’t cleared. The momentum had swung Chichester’s way. Haitham went close; Peake, who’d come off the bench, almost got something on a Clack free-kick; and Dave Herbert wasn’t far off with a left footed effort. A lovely piece of skill from Sam Ndlovu helped him drift past his marker to set up a shot that was inches wide. City finally scored again on 86 minutes when Peake slid in to connect with a Clack cross. There was still time for another chance for Jones and the hosts were reduced to ten men when Paul Weathery was given a straight red for a foul on Haitham. That result leaves Chi in third place, five points behind top-of-the-table Horsham YMCA. City go to East Preston in the Sussex Senior Cup on Tuesday night, then Shoreham will visit Oaklands Park on Saturday at 3pm. Chichester: Matthews, Lewis, Martin, Biggs, Cody, Pashley, Clack, Way, Jones, Hutchings, Haitham. Subs: Peake, Herbert, Ndlovu, Potter, Callnon.